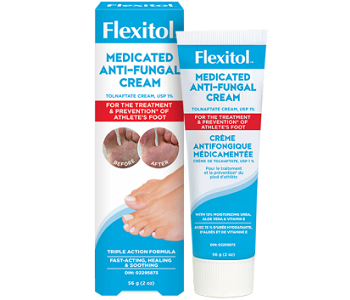 In this review, we will take a closer look at a product called Flexitol Medicated Anti-fungal Cream. The product claims to help prevent athlete’s foot whilst also rapidly and effectively proving relief to itchy and cracked skin. To find out more about the ingredients in Flexitol Medicated Anti-fungal Cream and how the product works, read our informative review below. The main active ingredient in Flexitol Medicated Anti-fungal Cream is Tolnaftate, USP 1%. The non-medicinal ingredients include Aqua, Urea, Aloe Vera, Cetearyl Alcohol, Parfum, Glycerin, and Sodium Phosphate, just to name a few. 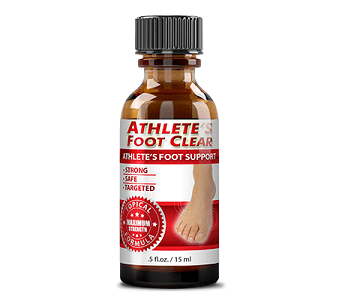 The manufacturer claims that these ingredients will help treat athlete’s foot due to the fast acting triple action formula. First it will treat the problem and then it will provide soothing relief and moisturize dry skin. This seems very promising, however, the product does not contain clinically proven ingredients such as 25% undecylenic acid. Lack of this strong fungal fighting agent may cause the product to be less effective in comparison with other products. The manufacturer suggests that the user wash their feet with soap and warm water and dry properly. The next step is to apply the product. Apply it twice a day for a full 4 weeks. After this time period, apply the product once or twice a day as needed to maintain healthy feet. Remember to pay special attention between the toes. The product is intended for adults and children above the age of 12. A 2 ounce tube of product can be purchased online from Amazon for $19.97. It can also be purchased from various online retailers from prices ranging between $9.21 and $14.99. Even though there are no discounts or bundle deals made available, this product is still priced very low and may be an indication of low-quality ingredients. Unfortunately, we were unable to find any evidence of a money-back guarantee and we were unable to find any customer reviews. These may indicate that the manufacturer does not believe in their product or the effectiveness thereof. Nonetheless, the customer will be at risk when making a purchase from this manufacturer and will not be refunded for returns. After our review of Flexitol Medicated Anti-fungal Cream, we have come across a few things that we seem to like. The manufacturer ensures that the user knows exactly when and how to apply the product to ensure the best results. However, there are many more things we have found that we do not like about the product. Firstly, the product does not contain the best fungal fighting agent that has been clinically proven for effectiveness. Lack thereof may leave the product behind other brands. Furthermore, the produce is very low which may support the fact that the product does not contain clinically proven, high-quality ingredients. Finally, the manufacturer does not back the product with a solid guarantee and you will be left at risk. Due to these negative aspects mentioned above, we are unable to recommend the safe and effective use of Flexitol Medicated Anti-fungal Cream. You are better off searching for an alternative anti-fungal product.